We're in the people business. We just happen to wash cars. 2 Ultimate Washes ($40 Value) mailed to every new car buyer at no cost! 1. Mail pre-addressed, stamped, unsealed envelopes and the dealership thank you letter for your new car buyer to Mike's Carwash. 2. 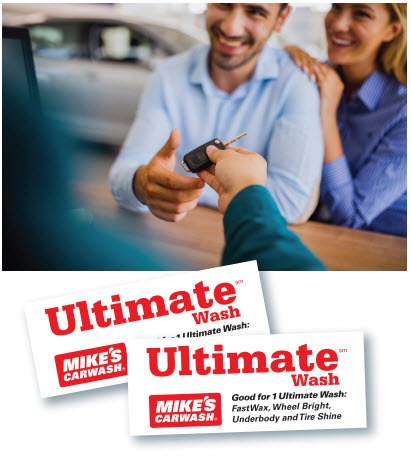 Mike's Carwash Customer Support Team will insert your dealership brochure (which includes the 2 FREE Ultimate Washes) along with the thank you letter in the customer envelope. 3. Mike's will mail your customer letters and brochure within one business day. IMPORTANT: Mike's does NOT retain your customer's information for any reason. Sign up today by calling 844-280-WASH (9274). © 2019 Mike's Carwash. All Rights Reserved.